키트 및 물품은 결장암을 II기 또는 III기 결장암으로 병기 결정하기 위해 7개 유전자 분석법을 수행하기 위한 시약을 포함한다. Kits and articles comprises a reagent for carrying out the seven genetic assay to determine the stage II colon cancer with group III or group colon cancer. 결장암의 정확한 병기 결정은 질환 예후 예측뿐만 아니라, 환자의 임상 관리 및 치료 선택에 도움이 된다. Accurate staging of colon cancer is a disease prognosis, as well as help in the clinical management and treatment of selected patients. 임상적 및 병리학적 특징에 근거한 TNM 시스템이 1940년대에 도입되었고, 차츰 발전되어 1980년대 이래 범용되고 있다. The TNM system based on the clinical and pathological features were introduced in the 1940s, it is gradually becoming universal development since the 1980s. 쿼크(Quirke) 등(2007). Quark (Quirke), etc. (2007). 이들 가이드라인에서, 적절한 림프절 평가는 결장암의 올바른 병기 결정에 결정적이다. In these guidelines, the appropriate lymph node evaluation is crucial to the proper staging of colon cancer. 그러나, 환자, 외과의사, 병리학자 및 종양 관련 변수들로 인해, 결장암 환자의 63%는 알맞은 림프절 평가를 받지 못할 수도 있다. However, patient, surgeon, pathologist and due to tumor-related variables, 63% of colon cancer patients may not receive the correct lymph node evaluation. 백스터(Baxter) 등(2005). Baxter (Baxter) (2005). 게놈 접근법이 암 분류 및 하위분류의 확인, 질환 진행 예측, 및 치료 선택 및 치료 반응 예측에 성공적으로 적용되어 왔다. Genomic approaches have been successfully applied to the identification, predicting disease progression and treatment response prediction and treatment selection for cancer classification and sub-classification. 바타차르제(Bhattacharjee) 등(2001); (2001), the butter char (Bhattacharjee); 칸(Khan) 등(2001); (2001), Khan (Khan); 소를리에(Sorlie) 등(2003); (2003), such as a cow Liege (Sorlie); 아그라왈(Agrawal) 등(2002); (2002) Agrawal (Agrawal); 및 왕(Wang) 등(2005). And Wang (Wang) (2005). 유전적 및 후성적 정보는 현행 암 진단 및 예후의 정확도를 향상시킬 기회를 제공하며, 임상적 및 병리학적 매개변수와 상호 보완적일 수 있다. After the genetic and qualitative information provides an opportunity to improve the accuracy of current cancer diagnosis and prognosis, it has proven to be clinical and pathological parameters and complementary. 마이크로어레이 분석을 이용하여, II기 결장암 환자에 대한 23개-유전자 예후 표지(signature)가 개발되었다. Using microarray analysis, 23 for group II colon cancer-gene prognostic markers (signature) have been developed. 왕 등(2004). Wang et al. (2004). 이 표지는 다수의 임상 기관으로부터 입수한 독립적인 시료에서 추가로 유효성이 입증되었다. The cover is the efficacy was demonstrated in a further independent sample obtained from a number of clinical institutions. 지앙(Jiang) 등(2008). Jiang (Jiang) et al. (2008). 그러나, 여전히 유전자 표지의 예후적 가치가 종양의 더욱 정확한 병기 결정을 통해 향상될 수도 있다고 여겨진다. However, it still believed that the prognostic value of genetic markers could be improved through more accurate staging of the tumor. 본 발명의 일 태양에서, 진단은 결장암이 II기인지 III기인지 여부를 결정하기 위한 7개-유전자 표지를 포함한다. Includes genetic markers - In one aspect of the invention, diagnosis is 7 for determining whether colon carcinoma is that the group II group III. 발명의 다른 태양에서, 진단은 II기와 III기 결장암을 구별하기 위해 사용되는 7개-유전자의 발현을 탐지하기 위한 시약을 포함한다. In another aspect of the invention, diagnosis is 7 that is used to distinguish between the group II group III colon cancer - comprises a reagent for detecting the expression of the gene. 발명의 또 다른 태양에서, II기와 III기 결장암을 구별하고/하거나 결과의 예후를 제공하는 키트는 7개-마커 유전자 및, 선택적으로, 일군의 구성적으로 발현되는 유전자들의 발현을 탐지하기 위한 시약을 포함한다. In a further aspect of the invention, II group III group distinguish the colon and / or 7 are kits providing a prognosis of the outcome - the marker gene and, optionally, a group of constitutive reagent for detecting the expression of genes expressed in It includes. 도 1은 어피메트릭스 마이크로어레이를 사용한, 137명의 II기 및 III기 환자에 대한 7개-유전자 표지의 ROC 및 카플란-메이어 생존 분석(Kaplan-Meier survival analysis)으로, 도 1a는 7개-유전자 표지의 ROC 곡선이고, 도 1b는 7개-유전자 표지를 사용한 137개 냉동 종양 시료의 카플란-메이어 곡선 및 로그 순위 검정이며, 고위험군과 저위험군은 유의하게 다름 (P= 0.007). With Mayer survival analysis (Kaplan-Meier survival analysis), Figure 1a 7-1 is used an Affymetrix microarray, 137 II group and III group 7 to the patient-ROC and Kaplan of genetic markers genetic markers of a ROC curve, Fig. 1b is a seven-Kaplan of 137 frozen tumor samples using marker genes - a Meyer curves and the log rank test, high risk and low-risk group was significantly different from that (P = 0.007). 도 2는 RTQ-PCR을 이용한, 123개 FPE II기 및 III기 시료에 대한 7개-유전자 표지의 ROC 및 카플란-메이어 생존 분석으로, 도 2a는 7개-유전자 표지의 ROC 곡선이고, 도 2b는 7개-유전자 표지를 사용한 123개 FPE 시료의 카플란-메이어 곡선 및 로그 순위 검정이며, 고위험군과 저위험군은 유의하게 다름 (P= 0.0271). 2 is seven for Using RTQ-PCR, the 123 FPE II group and III group sample-by Meyer survival analysis, Figure 2a is 7 - - ROC and Kaplan of genetic markers is the ROC curve of genetic markers, Figure 2b It is 7-Kaplan of 123 FPE samples with genetic markers - a Meyer curves and the log rank test, high risk and low-risk group was significantly different (P = 0.0271). 도 3은 RTQ-PCR을 이용한, 4개의 상이한 임상 기관으로부터 입수한 180개의 독립적인 FPE II기 결장암 시료에 대한 7개-유전자 표지의 카플란-메이어 생존 분석임. Figure 3 Using RTQ-PCR, 7 dog for 180 independent FPE group II colon cancer samples obtained from four different clinical institutions - the genetic markers Kaplan-Meyer survival being analyzed. II기 및 III기 결장암의 병기 결정을 위한 가장 중요한 임상적 요인들 중 하나는 결절 병발이고 임상적 가이드라인은 적절한 병기 결정을 위해 적어도 12개의 결절이 조사되어야 한다고 권고한다. One of the most important stage II and stage III clinical factors for the staging of colorectal cancer is recommended that the nodules and Associated Clinical Guidelines is at least 12 nodules should be investigated for the proper staging. 그러나, 결장암 환자의 40% 미만이 적합한 림프절 평가를 받는다. However, given the lymph node evaluation is less than 40% of colon cancer patients suitable. 백스터 등 (2005). Baxter et al. (2005). II기 결장암에서 종양 재발을 예측하기 위한 23개-유전자 예후 표지가, 예를 들어, 본 명세서에 그 전체가 참고로 포함되는 미국 특허 출원 공개 제20060063157호에 이미 언급되어 있다. 23 for predicting tumor recurrence in stage II colon cancer-gene prognostic markers, for example, has already been referred to in U.S. Patent Application Publication No. 20,060,063,157 included in its entirety as a reference herein. 그 후, 이 표지는 신선한 냉동 종양 표본을 사용한 123명의 II기 결장암의 독립적인 환자군 및 포르말린 고정 파라핀 포매 시료를 사용한 110명의 II기 환자군에서 유효성이 입증되었다. Then, the cover is the efficacy was demonstrated in 110 patients with stage II patients independent group and formalin fixed paraffin-embedded samples of 123 stage II colon cancer with fresh frozen tumor samples. 지앙 등 (2008). Jiang et al. (2008). 본 발명은 더욱 정확한 병기 결정에 관한 것이다. The present invention relates to a more accurate staging. 바이오마커(biomarker)는 지시되는 마커 핵산/단백질의 임의의 증표이다. Biomarkers (biomarker) is any sign of the marker nucleic acid / protein indicated. 핵산은, 핵 핵산, 미토콘드리아 핵산(호모플라스미(homeoplasmy), 헤테로플라스미(heteroplasmy)), 바이러스 핵산, 세균 핵산, 진균 핵산, 마이코플라즈마 핵산 등을 포함하지만 이로 한정되지 않는 당업계에 공지된 임의의 것일 수 있다. Nucleic acids, nuclear nucleic acid, mitochondrial nucleic acid (homo plasmid (homeoplasmy), heteroaryl plasmid (heteroplasmy)), an the like viral nucleic acid, bacterial nucleic acid, fungal nucleic acids, mycoplasma nucleic acid, but known in the art that is not limited to any the may be. 이 증표는 직접적 또는 간접적일 수 있고, 생리학적 매개변수가 주어지고 내부 대조군, 위약, 정상 조직 또는 다른 암종과 비교하여 유전자의 과- 또는 저-발현을 측정한다. The token may be a direct or indirect, physiological parameters are given and in the gene compared to the internal control, placebo, or other normal tissues, cancer-measures the expression of - or Me. 바이오마커에는 핵산 및 단백질(과- 및 저-발현 및 직접적 및 간접적 모두)이 포함되지만 이로 한정되지는 않는다. Biomarkers include nucleic acids and proteins (as-and low-expression, and both direct and indirect), including, but are not limited to. 바이오마커로서 핵산의 사용은 DNA 증폭, 결실, 삽입, 중복, RNA, 마이크로RNA(miRNA), 이형접합 소실(loss of heterozygosity, LOH), 단일 뉴클레오티드 다형성(SNP, 브룩스(Brookes) (1999)), 직접적 또는 게놈 증폭시의 카피수 다형성(CNP), 미세위성(microsatellite) DNA, DNA 저메틸화 또는 과메틸화와 같은 후성적 변화 및 FISH를 측정하는 것을 포함하지만 이로 한정되지 않는 당업계에 공지된 임의의 방법을 포함할 수 있다. Use of a nucleic acid as a biomarker is a DNA amplification, deletion, insertion, duplication, RNA, micro-RNA (miRNA), heterozygous loss (loss of heterozygosity, LOH), single nucleotide polymorphisms (SNP, Brooks (Brookes) (1999)), any of the post, such as a copy number polymorphism (CNP), micro-satellite (microsatellite) DNA, DNA that methylation or hypermethylation of the city directly or genomic amplification include measuring the grade change and FISH but known in the art are not limited to, It may include a method. 바이오마커로서 단백질의 사용에는 양, 활성, 당화, 인산화, ADP-리보실화, 유비퀴틴화 등과 같은 변형 또는 면역조직화학(IHC) 및 턴오버(turnover)를 측정하는 것을 포함하지만 이로 한정되지 않는 당업계에 공지된 임의의 방법을 포함한다. The art, the use of the protein as a biomarker includes to measure the deformation or immunohistochemistry (IHC) and turnover (turnover) such as the amount, activity, glycosylation, phosphorylation, ADP- ribonucleic misfire, ubiquitination, but are not limited to, to include any known method. 다른 바이오마커에는 이미지화, 분자적 프로파일링, 세포 계수 및 아폽토시스 마커가 포함된다. Imaging the other biomarkers, it includes molecular profiling, cytometry and apoptosis markers. 마커 유전자는 해당 서열을 포함하는 경우 서열번호로 표시된 특정 서열에 대응한다. The marker gene corresponds to the particular sequence shown in SEQ ID NO: those containing the sequence. 유전자 절편 또는 단편은 언급된 서열 또는 그의 상보체의 일부로서 해당 유전자의 서열인 것으로 식별하기에 충분한 일부분을 포함하는 경우 이러한 유전자의 서열에 대응한다. If it contains a sufficient portion for identifying to be the sequence of the gene or gene fragment is a fragment as part of the sequence or its complement mentioned corresponds to the sequence of this gene. 유전자 발현 생성물은 그의 RNA, mRNA, 또는 cDNA가 이러한 서열을 갖는 구성물(예컨대, 프로브)에 혼성화될 때 이러한 서열에 대응하거나, 펩티드 또는 단백질의 경우 이것은 그러한 mRNA에 의해 코딩된다. For the gene expression product is its RNA, mRNA, or those corresponding to the sequence, or a peptide or protein when the cDNA is to be hybridized to the composition (e.g., a probe) having such a sequence which is encoded by such mRNA. 유전자 발현 생성물의 절편 또는 단편은 언급된 유전자 발현 생성물 또는 그의 상보체의 일부로서 해당 유전자 또는 유전자 발현 생성물의 서열인 것으로 식별하기에 충분한 일부분을 포함하는 경우 이러한 유전자 또는 유전자 발현 생성물의 서열에 대응한다. Fragment or fragments of the gene expression product if it contains a sufficient portion for identifying to be the sequence of the gene or gene expression product as a portion of the stated gene expression product or its complement correspond to such a gene or sequence of the gene expression products . 본 명세서에 기술되고 청구된 본 발명의 방법, 조성물, 물품, 및 키트는 하나 이상의 마커 유전자를 포함한다. This is described in the specification, it claims a method of the present invention, compositions, articles, and kits comprising one or more marker genes. "마커" 또는 "마커 유전자"는 본 명세서 전체에서 그의 과발현 또는 저발현이 지시 또는 조직 유형과 연관되는 임의의 유전자에 부합하는 유전자 및 유전자 발현 생성물을 일컫는 것으로 사용된다. "Marker" or "marker gene" is used herein refers to its over-expression or low expression of the genes and gene expression products conforming to any gene that is associated with instructions or tissue type in this specification. 유전자 발현 프로파일을 확립하기 위한 바람직한 방법에는 단백질 또는 펩티드를 코딩할 수 있는 유전자에 의해 생성된 RNA의 양을 결정하는 것이 포함된다. Preferred methods for establishing gene expression profiles include those for determining the quantity of RNA produced by a gene that can code for a protein or peptide. 이는 역 전사효소 PCR(RT-PCR), 경쟁적 RT-PCR, 실시간 RT-PCR, 차등 표시(differential display) RT-PCR, 노던 블롯 분석 및 다른 관련된 검사에 의해 완수된다. This is accomplished by reverse transcriptase PCR (RT-PCR), competitive RT-PCR, real time RT-PCR, differential display (differential display) RT-PCR, Northern Blot analysis and other related tests. 개별적인 PCR 반응을 이용해 이들 기법을 수행하는 것이 가능하지만, mRNA로부터 생산된 상보 DNA(cDNA) 또는 상보 RNA(cRNA)를 증폭하고 이를 마이크로어레이를 통해 분석하는 것이 최선이다. It is possible, but it is best to amplify complementary DNA (cDNA) or complementary RNA (cRNA) produced from mRNA and analyze it via microarray to perform these techniques using individual PCR reactions. 다수의 상이한 어레이 구성 및 이들의 생성을 위한 방법이 당업계의 숙련자에게 공지되어 있고, 예를 들어, 미국 특허 제5445934호, 제5532128호, 제5556752호, 제5242974호, 제5384261호, 제5405783호, 제5412087호, 제5424186호, 제5429807호, 제5436327호, 제5472672호, 제5527681호, 제5529756호, 제5545531호, 제5554501호, 제5561071호, 제5571639호, 제5593839호, 제5599695호, 제5624711호, 제5658734호, 및 제5700637호에 기술되어 있다. Multiple and different array configurations and a method for their generation are known to those skilled in the art, e.g., U.S. Patent No. 5,445,934, 1 - 5532128, 1 - 5556752, 1 - 5242974, 1 - 5384261, 1 - 5,405,783 , 1 - 5412087, 1 - 5424186, 1 - 5429807, 1 - 5436327, 1 - 5472672, 1 - 5527681, 1 - 5529756, 1 - 5545531, 1 - 5554501, 1 - 5561071, 1 - 5571639, 1 - 5593839 call, No. 5,599,695, 1 - No. 5,624,711, is described in the claim No. 5,658,734, No. 5,700,637 and No..
마이크로어레이 기술은 동시에 수천 개 유전자들의 항정상태(steady-state) mRNA 수준의 측정을 가능케 하여 조절되지 않는 세포 증식의 개시, 정지, 또는 조정과 같은 효과를 식별하기 위한 강력한 도구를 제시한다. Microarray technology presents a powerful tool for identifying effects such as the thousands of steady state (steady-state) the start of cell proliferation that is not controlled to allow for the measurement of mRNA levels of genes, stop, or adjustment, at the same time. 2종의 마이크로어레이 기술이 현재 광범위하게 사용되고 있다. The microarray technology has been used two types of currently widely used. 첫 번째는 cDNA 어레이이고 두 번째는 올리고뉴클레오티드 어레이이다. The first is the cDNA arrays and the second are oligonucleotide arrays. 이들 칩들의 제작에 차이점이 있기는 하나, 필수적으로 모든 하류 데이터 분석 및 출력은 동일하다. There is a difference in the production of these chips is one, essentially all downstream data analysis and output are the same. 이들 분석의 산물은 전형적으로 마이크로어레이 상에서 기지의 위치에서 핵산 서열에 혼성화하는 시료 유래의 cDNA 서열을 탐지하기 위해 사용되는 표지된 프로브로부터 입수되는 신호의 강도의 측정치이다. The product of these analyzes are typically measurements of the intensity of a signal received from a labeled probe used to detect a cDNA sequence derived from the sample that hybridizes to a nucleic acid sequence at a known location on the microarray. 전형적으로, 신호 강도는 시료 세포 내에서 발현된 cDNA, 따라서 mRNA의 양에 비례한다. Typically, signal intensity is proportional to the quantity of cDNA, therefore mRNA expressed in the sample cells. 다수의 이러한 기술들이 이용가능하고 유용하다. A number of such techniques are available and useful. 유전자 발현을 결정하는 데 바람직한 방법은 미국 특허 제6271002호, 제6218122호, 제6218114호 및 제6004755호에서 확인될 수 있다. Determining the gene expression of a preferred method may be found in U.S. Patent No. 6,271,002, 1 - No. 6,218,122, No. 6,218,114 and No. 6,004,755 arc. 발현 수준의 분석은 이러한 신호 강도를 비교함으로써 수행된다. Analysis of the expression levels is conducted by comparing such signal intensities. 이는 검사 시료 내 유전자의 발현 강도 대 대조군 시료 내 유전자의 발현 강도의 비율 매트릭스(ratio matrix)를 작성함으로써 가장 잘 수행된다. This is best done by creating a ratio matrix (matrix ratio) of expression strength of the gene expression for the intensity in the control sample in genetic test sample. 예를 들어, 병든 조직으로부터의 유전자 발현 강도를 동일한 유형의 양성 또는 정상 조직으로부터 생성된 발현 강도와 비교할 수 있다. For example, it can be compared with the resulting expression of the gene expression strength intensity from the diseased tissue from benign or normal tissue of the same type. 이들 발현 강도의 비율은 검사 시료와 대조군 시료 사이의 유전자 발현의 배수 변화를 나타낸다. The ratio of these expression intensities indicates the multiple changes in gene expression between the test sample and the control sample. 종양의 최초 부위에 관련된 인자들 간 각 유전자의 차등 발현에 대한 유의성의 증거와 관련된 순위가 매겨진 목록을 산출하는 통계적 검정에 근거하여 선택이 이루어질 수 있다. It may be based on a statistical analysis to calculate the list of priority associated with evidence of the significance of the differential expression of each gene among factors related to the original site of the tumor numbered made a choice. 이러한 검사의 예에는 아노바(ANOVA) 및 크루스칼-왈리스(Kruskal-Wallis)가 포함된다. Examples of such tests include ah Nova (ANOVA) and Kruskal-Wallis include (Kruskal-Wallis). 순위는 컷오프까지 가중치들의 합계를 한 부류를 다른 부류보다 지지하는 증거의 우세로 해석하도록 고안된 모델에서 가중치로서 사용될 수 있다. Ranking it can be used as weights in a class designed models to interpret the sum of the weights to the cut-off to lead evidence to support than the other classes. 문헌에 기재된 기존의 증거들이 또한 가중치를 조절하는 데 사용될 수도 있다. To existing evidence in the literature it may also be used to adjust the weights. 바람직한 실시 형태는 안정적인 대조군 세트를 알아내고 이 세트를 모든 시료에 대해 제로 분산(zero variance)으로 개산함으로써 각 측정을 정규화하는 것이다. A preferred embodiment is to find out a stable control group set to normalize each measurement by the estimated zero dispersion (zero variance) for the set of all samples. 이 대조군 세트는 분석 내 계통 오차에 의해 영향을 받으며 이 오차와 관계없이 변하는 것으로 판명되지 않은 임의의 단일 내인성 전사체 또는 내인성 전사체의 세트로서 정의된다. The control set is affected by a systematic error in analysis are defined as a set of any single endogenous transcripts or endogenous transcripts are not found to be changed, regardless of the error. 모든 마커들은 평균 또는 중앙값과 같은 대조군 세트의 임의의 기술 통계량(descriptive statistic), 또는 직접적인 측정에 대해 제로 분산을 만들어내는 시료 특이적 인자에 의해 조절된다. All markers are controlled by the sample-specific parameters to produce a dispersant for any descriptive statistics (descriptive statistic), or direct measurement of the control set, such as the mean or median. 대안적으로, 만약 대조군의 변동이 계통 오차에만 관련된다는 전제가 참이 아니지만 여전히 결과적인 분류 오차가 정규화가 수행되는 경우 더 작다면, 대조군 세트는 지시된 대로 여전히 사용될 것이다. Alternatively, if the premise is that a change of control related only to systematic error, but this is still true that the resulting classification error is less when normalization is performed, the control set will still be used as directed. 비내인성 스파이크(spike) 대조군이 또한 도움이 될 수 있지만, 바람직하지는 않다. Although the non-endogenous spikes (spike) control may also be helpful, it is not preferable. 유전자 발현 프로파일은 다수의 방식으로 표시될 수 있다. Gene expression profiles can be displayed in a number of ways. 원 형광 강도 또는 비율 매트릭스를 세로열은 검사 시료를 나타내고 가로행은 유전자를 나타내는 도식적 계통수로 배열하는 것이 가장 보편적이다. Column raw fluorescence intensities or ratio matrix indicates the test sample is a horizontal row, it is the most common arrangement for a phylogenetic tree showing the schematic gene. 데이터는 유사한 발현 프로파일을 갖는 유전자들이 서로 인접하도록 배열된다. The data is arranged so genes that have similar expression profiles are adjacent to each other. 각 유전자의 발현율은 색상으로 가시화된다. Expression of each gene is visualized as a color. 예를 들어, 1 미만의 비율(하향 조절)은 스펙트럼의 청색 부분에 나타나는 반면 1 초과의 비율(상향 조절)은 스펙트럼의 적색 부분에 나타난다. For example, a ratio less than one (down-regulation) is the ratio of greater than 1, while that appears in the blue part of the spectrum (up-regulation) appears in the red portion of the spectrum. "진스프링(Genespring)"(실리콘 제네틱스, 인크(Silicon Genetics, Inc.)) 및 "디스커버리(Discovery)" 및 "인퍼(Infer)"(파르텍, 인크(Partek, Inc.))를 포함하는 구매가능한 컴퓨터 소프트웨어 프로그램이 이러한 데이터를 표시하기 위해 이용가능하다. "Gene Spring (Genespring)" Buy containing (Silicon Genetics, Inc. (Silicon Genetics, Inc.)), and "Discovery (Discovery)" and "inpeo (Infer)" (Parr Tech, Inc. (Partek, Inc.)) the available computer software programs are available to display such data. 유전자 발현을 결정하기 위하여 단백질 수준을 측정하는 경우에는, 적절한 특이도와 감도가 얻어지는 한 당업계에 알려진 임의의 방법이 적합하다. When measuring protein levels to determine gene expression, it is suitable for any method known in the art, a suitable specific sensitivity is obtained help. 예를 들어, 단백질 수준은 해당 단백질에 대해 특이적인 항체 또는 항체 단편에의 결합 및 항체결합 단백질의 정량에 의해 측정할 수 있다. For example, protein levels can be measured by the amount of binding, and an antibody-binding protein to a specific antibody or antibody fragment for the protein. 항체는 방사성, 형광 또는 기타 탐지가능한 시약에 의해 표지되어 탐지를 촉진할 수 있다. The antibody is labeled by a radioactive, fluorescent or other detectable reagents to facilitate detection. 탐지 방법은 효소 결합 면역흡착 분석(enzyme-linked immunosorbent assay, ELISA) 및 면역블롯 기술을 포함하지만 이로 한정되지 않는다. Detection methods include enzyme linked immunosorbent analysis (enzyme-linked immunosorbent assay, ELISA) and immunoblot techniques, but are not limited to. 본 발명의 방법에 사용되는 조절된 유전자들이 실시예에 기재된다. The control gene to be used in the process of the invention are described in the Examples. 차등 발현되는 유전자들은 특정 기원의 암종을 가진 환자에서 상이한 기원 유래의 암종을 가진 환자에 비해 상향 조절되거나 하향 조절된다. Genes that are differentially expressed are adjusted upregulate compared to patients with carcinomas of different origin derived from patients with carcinoma of the specific origin or downward. 상향 조절 및 하향 조절은 유전자들의 발현량에서 모종의 기저선에 대비하여 탐지가능한 (측정에 사용된 시스템 내 노이즈의 기여를 넘는) 차이가 발견되는 것을 의미하는 상대적 용어이다. Up-regulation and down-regulation is a relative term that means that the difference is detected (greater than the contribution of noise in the system used for the measurement) detectable against the baseline of the seedlings in the expression level of the gene. 이 경우, 기저선은 알고리즘에 기초하여 결정된다. In this case, the baseline is determined based on the algorithm. 그러면 병든 세포 내 관심 유전자는 동일한 측정 방법을 이용한 기저선 수준에 대비해 상향 조절되거나 하향 조절된다. The gene of interest within the diseased cells are up-regulated or down-regulated in preparation for the baseline level using the same measurement method. 이 맥락에서, "병든"은 세포의 조절되지 않는 증식으로 야기되는 것과 같이 신체 기능의 적절한 성능을 저지하거나 방해하고, 또는 방해할 가능성을 갖는 신체 상태의 변경을 일컫는다. In this context, "sick" refers to a change in physical condition, have the potential to block or interfere with the proper performance of bodily functions, and or disturbance as caused by the uncontrolled proliferation of cells. 어떤 사람의 유전자형 또는 표현형의 일부 양상이 질환의 존재와 부합하는 경우 그는 질환을 가진 것으로 진단된다. If a person genotypic or phenotypic some aspects of complying with the presence of the disease he is diagnosed as having the disease. 그러나, 진단 또는 예후를 수행하는 행위는 재발 가능성, 치료법 유형 및 치료법 관찰을 결정하는 것과 같은 질환/상태 문제의 결정을 포함할 수도 있다. However, diagnosis or acts that perform the prognosis may include the determination of disease / status issues such as determining the possibility of recurrence observed, treatment type and treatment. 치료법 관찰에서, 시간을 두고 유전자들의 발현을 비교하여 유전자 발현 프로파일이 정상 조직에 더욱 일치하는 양상으로 변화하였거나 변화하고 있는지 여부를 결정함으로써 정해진 치료 과정의 효과와 관련하여 임상적 판단이 이루어진다. In observed therapy, over time, by comparing the gene expression of relevant to the effect of the course of treatment prescribed by determining whether or not the change hayeotgeona changing aspect of the gene expression profile more consistent with normal tissue is made as clinical judgment. 집단 내 유전자 세트에 대해 수득된 정보가 진단, 예후, 또는 치료 선택과 같은 임상적으로 관련있는 판단을 내리기 위한 확고한 근거를 제공하도록 유전자들을 집단으로 나눌 수 있다. Genes can be divided to provide a firm basis for making a determination that the obtained information about the set of genes that are relevant to the population, such as clinical diagnosis, prognosis, or treatment choice in a group. 이들 유전자 세트들은 본 발명의 포트폴리오를 구성한다. These genes are set to a portfolio of the present invention. 대부분의 진단 마커에 대해 그러하듯이, 정확한 의학적 판단을 내리기에 충분한 가장 적은 수의 마커들을 사용하는 것이 종종 바람직하다. As is true for most diagnostic markers, it is often desirable to use the fewest number of markers sufficient to make a correct medical judgment. 이는 추가 분석 동안의 치료 지연뿐만 아니라 시간 및 자원의 비생산적인 사용을 방지한다. This prevents the unproductive use of time and resources, as well as the treatment delay for further analysis. 유전자 발현 포트폴리오를 확립하는 하나의 방법은 주식 포트폴리오를 확립하는 데 광범위하게 사용되는 평균 분산 알고리즘과 같은 최적화 알고리즘의 사용을 통해서이다. One method of establishing gene expression portfolios is through the use of optimization algorithms such as the mean variance algorithm widely used in establishing the equity portfolio. 이 방법은 미국 특허 출원 공개 제20030194734호에 상세히 기재되어 있다. This method is described in detail in U.S. Patent Application Publication No. 20,030,194,734. 필수적으로, 이 방법은 수익의 가변성을 최소화하면서 해당 세트를 사용함으로써 받게 되는 수익(예컨대, 발생되는 신호)을 최적화시킬 입력항목 세트(재무 분야에서는 주식, 여기서는 강도에 의해 측정된 발현)의 수립을 요구한다. In essence, the establishment of the method entries set to optimize the return (e.g., signal that is generated) is received by using the corresponding set with a minimum of variability in the return (in the financial field Co., in which the expression as measured by intensity) demands. 다수의 상업적 소프트웨어 프로그램이 이러한 작업을 수행하기에 이용가능하다. A number of commercial software programs are available to perform these tasks. 본 명세서 전체에서 "와그너 소프트웨어(Wagner Software)"로 언급되는 "와그너 어소시에이츠 평균-분산 최적화 응용 프로그램(Wagner Associates Mean-Variance Optimization Application)"이 바람직하다. In this specification, "Wagner Software (Wagner Software)", referred to as the "Wagner Associates Mean-variance optimization application (Wagner Associates Mean-Variance Optimization Application)" is preferable. 이 소프트웨어는 효율적 투자경계선(efficient frontier)을 결정하기 위해 "와그너 어소시에이츠 평균-분산 최적화 라이브러리(Wagner Associates Mean-Variance Optimization Library)" 유래 함수를 사용하며 마르코위츠 (Markowitz) 방식에서의 최적 포트폴리오가 선호된다. The software efficiently invest borders (efficient frontier) to to decide - using the "Wagner Associates mean variance optimization library (Wagner Associates Mean-Variance Optimization Library)" derived function and the optimal portfolio of Marco wicheu (Markowitz) method is preferred . 마르코위츠 (1952). Marco wicheu (1952). 이러한 유형의 소프트웨어의 사용은, 소프트웨어가 본래 의도된 재무 분석 목적으로 사용되는 경우에 주식 수익률 및 위험도 측정이 사용되는 방식으로 마이크로어레이 데이터가 입력항목으로서 처리될 수 있도록 변환되는 것을 요구한다. The use of this type of software requires that the software is converted to microarray data can be processed as input items in such a way that the stock return and risk measurements are used when the financial analysis purposes the originally intended use. 포트폴리오를 선별하는 과정은 또한 경험적 규칙의 적용을 포함할 수 있다. The process of selecting a portfolio can also include the application of heuristic rules. 바람직하게는, 이러한 규칙은 생물학 및 임상 결과를 산출하기 위해 사용된 기술의 이해에 근거하여 수립된다. Preferably, such rules are established on the basis of the understanding of the technology used to produce the biology and clinical outcomes. 더욱 바람직하게는, 이들은 최적화 방법으로부터 얻은 출력에 적용된다. More preferably, it is applied to the output obtained from the optimization method. 예를 들어, 포트폴리오 선발의 평균 분산 방법이 암 환자에게서 차등 발현되는 다수의 유전자들에 대한 마이크로어레이 데이터에 적용될 수 있다. For example, can be applied to microarray data for a number of genes is the average variance method of portfolio selection that is differentially expressed from cancer patients. 이 방법으로부터 얻어지는 출력은 병든 조직에서뿐만 아니라 말초 혈액에서 발현되는 일부 유전자들을 포함할 수 있는 최적화된 유전자 세트일 것이다. The output obtained from this method will work, as well as diseased tissue gene sets that can be optimized include some genes that are expressed in peripheral blood. 만약 검사 방법에 사용된 시료가 말초 혈액에서 얻은 것이고 암의 사례에서 차등 발현된 특정 유전자들이 말초 혈액에서도 차등 발현될 수 있다면, 말초 혈액에서 차등 발현된 것들을 배제하는 효율적 투자경계선으로부터 포트폴리오가 선택되는 경험적 규칙이 적용될 수 있다. If the general rule, which is a sample of peripheral will obtained from the blood certain genes differentially expressed in cases of cancer are there to be differentially expressed in peripheral blood, the portfolio is selected from the efficient investment boundaries to exclude things that differentially expressed in peripheral blood using the test method this rule can be applied. 물론 이 규칙은, 예를 들어 데이터 사전 선별 과정에서 규칙을 적용함으로써 효율적 투자경계선의 형성 이전에 적용될 수 있다. Of course, this rule, e.g., by applying a rule from the data pre-selection process may be applied before the formation of border-effective investment. 문제의 생물학과 반드시 관련된 것은 아닌 다른 경험적 규칙이 적용될 수 있다. There is not necessarily related to biology and other empirical rules, not of the problem can be applied. 예를 들어, 특정 유전자 또는 유전자군이 포트폴리오의 소정 비율만을 차지할 수 있다는 규칙이 적용될 수 있다. For example, there is a rule that the particular gene or gene cluster can occupy only a predetermined percentage of the portfolio can be applied. 와그너 소프트웨어와 같은 구매가능한 소프트웨어가 이러한 유형의 경험적 방법을 용이하게 수용한다. The commercially available software such as the Wagner Software readily accommodates these types of empirical methods. 이는, 예를 들어, 정확도 및 정밀도 이외의 요인들(예컨대, 예상 라이센싱료)이 어떤 하나 이상의 유전자들을 포함시키는 것이 바람직한지에 영향을 미치는 경우에 유용할 수 있다. This, for example, the accuracy and the factors other than the precision (e.g., anticipated licensing fees) may be useful if it is desired on the influence on whether to include any one or more genes. 본 발명의 유전자 발현 프로파일은 또한 암 진단, 예후, 또는 치료 관찰에 유용한 기타 비유전적 진단 방법과 함께 사용될 수 있다. Gene expression profiles of the invention can also be used with other dielectric entirely diagnostic methods useful in cancer diagnosis, prognosis, treatment or observation. 예를 들어, 일부 상황에서는 상기에 기재된 유전자 발현 기반 방법의 진단력과 혈청 단백질 마커와 같은 통상적인 마커(예컨대, 암 항원 27.29 ("CA 27.29"))로부터 얻은 데이터를 조합하는 것이 유익하다. For example, it is advantageous in some situations to combine the data from conventional markers (e.g., Cancer Antigen 27.29 ( "CA 27.29")), such as a gene expression-based methods of diagnosis force and serum protein markers described in the above. CA 27.29와 같은 피분석물을 포함하는 일련의 이러한 마커들이 존재한다. There are a series of these markers containing the target analyte, such as CA 27.29. 하나의 이러한 방법에서는, 치료받은 환자로부터 혈액을 정기적으로 채취한 후 상기에 기재된 혈청 마커들 중 하나에 대한 효소 면역분석에 적용한다. In one such method, the one from the treated patient's blood on a regular basis and then applied to the enzyme immunoassay for one of the serum markers described above. 마커의 농도가 종양의 재발 또는 치료법 실패를 제시하는 경우, 유전자 발현 분석이 가능한 시료 공급원을 채취한다. If the concentration of the marker suggests the recurrence of the tumor or treatment failure, the sample can be taken from the source of the gene expression analysis. 의심스러운 덩어리가 존재하는 경우, 미세 바늘 흡인물(FNA)을 취한 후 덩어리로부터 채취한 세포의 유전자 발현 프로파일을 상기에 기재된 바와 같이 분석한다. If a suspicious lump is present, after taking a fine needle aspirate (FNA) a gene expression profile of cells collected from the lump analysis as described above. 대안적으로, 이전에 종양이 제거되었던 곳의 조직에 인접한 영역으로부터 조직 시료를 채취할 수도 있다. Alternatively, it is also possible to collect a tissue sample from a region adjacent to the tissue where the tumor was previously removed. 이 접근법은 다른 검사가 모호한 결과를 산출하는 경우 특히 유용할 수 있다. This approach may be particularly useful when other tests for calculating an ambiguous result. 핵산 및 단백질을 분리하는 방법은 당업계에 잘 알려져 있다. The separation of nucleic acids and proteins are well known in the art. 예를 들어 그 전체가 본 명세서에 참고로 포함되는 미국 특허 제6,992,182호 및 인터넷 월드 와이드 웹(World Wide Web) 상의 앰비온 웹사이트(Ambion website)에서 RNA 분리의 논의, 및 미국 특허 공개 제20070054287호를 참고하라. For example, in its entirety U.S. Patent No. 6,992,182 which is incorporated herein by reference, and the Internet World Wide Web (World Wide Web) aembi on the website discussed in RNA isolation from (Ambion website), and US Patent Publication No. 20070054287 call on Make a note. DNA 분석은, 메틸화, 탈-메틸화, 핵형분석(karyotyping), 배수성(이수성(aneuploidy), 다배수성(polyploidy)), DNA 온전성(겔 또는 분광광도법으로 평가됨), 전위, 돌연변이, 유전자 융합, 활성화, 비활성화, 단일 뉴클레오티드 다형성(SNP), 유전적 구성을 탐지하기 위한 카피수 또는 전 게놈 증폭을 포함하지만 이로 한정되지 않는 당업계에 공지된 어느 하나일 수 있다. DNA analysis, methylation, de-methylated, karyotype analysis (karyotyping), drainage (aneuploidy (aneuploidy), the drainage (polyploidy)), DNA integrity (evaluated as a gel or a spectrophotometric method), the potential, mutation, genetic fusion, activation , may be disabled, a single nucleotide polymorphism (SNP), can be copied to detect the genetic makeup or around comprises a genome amplification, but which is well known in the art that is not limited to one. RNA 분석은, q-RT-PCR, miRNA 또는 전사후 변형을 포함하지만 이로 한정되지 않는 당업계에 공지된 어느 하나를 포함한다. The RNA analysis, including the q-RT-PCR, miRNA or posttranslational modification but including the one known in the art are not limited. 단백질 분석은, 항체 탐지, 번역후 변형 또는 턴오버를 포함하지만 이로 한정되지 않는 당업계에 공지된 어느 하나를 포함한다. Protein assay, antibody detection, and post-translational modifications include or turnover, but including the one known in the art are not limited. 단백질은 세포 표면 마커, 바람직하게는 상피, 내피, 바이러스 또는 세포 유형일 수 있다. Protein may be a type cell surface marker, preferably epithelial, endothelial, virus or cell. 바이오마커는 바이러스/세균 감염, 손상 또는 항원 발현에 관련될 수 있다. Biomarkers may be related to virus / bacterial infection, damage or antigen expression. 본 발명에 따라 제작된 키트는 유전자 발현 프로파일을 결정하기 위한 포맷화된 분석(formatted assays)을 포함한다. A kit made in accordance with the invention include formatted assays for determining the gene expression profile (formatted assays). 이들은 시약 및 설명서와 같이 분석을 수행하는 데 요구되는 모든 또는 일부 재료들 및 그를 통해 바이오마커가 분석되는 매체를 포함할 수 있다. These may include media that biomarker analysis through him all or part of the material required to perform the analysis, such as reagents and instructions and. 본 발명의 물품은 질환을 치료하고, 진단하고, 예측하고, 기타 평가하는 데 유용한 유전자 발현 프로파일의 표현을 포함한다. Article according to the present invention includes the representation of gene expression profiles useful for treating disease, diagnosing, predicting, and other evaluation. 이들 프로파일 표현은 컴퓨터 판독가능 매체(자기적, 광학적 등)와 같이 기계에 의해 자동적으로 판독될 수 있는 매체로 바꾸어진다. These profile representations are replaced with media that can be automatically read by a machine such as computer readable media (magnetic, optical, etc.). 물품은 또한 이러한 매체 내 유전자 발현 프로파일을 평가하기 위한 설명서를 포함할 수 있다. Goods can also include instructions for assessing the gene expression profiles in such media. 예를 들어, 물품은 상기에 기재된 유전자 포트폴리오의 유전자 발현 프로파일을 비교하기 위한 컴퓨터 설명서를 포함하는 CD ROM을 포함할 수도 있다. For example, the articles may comprise a CD ROM having computer instructions for comparing gene expression profiles of the gene portfolio described in the above. 물품은 또한 환자 시료로부터 얻은 유전자 발현 데이터와 비교할 수 있도록 그 안에 디지털 방식으로 기록된 유전자 발현 프로파일을 가질 수도 있다. Article may also have the gene expression profiles digitally recorded in to be compared with gene expression data from patient samples. 대안적으로, 프로파일은 상이한 표현 양식으로 기록될 수 있다. Alternatively, the profiles can be recorded in a different representation form. 도식적 기록은 이러한 양식의 하나이다. Graphical record is one of these forms. 상기에 언급된 파르텍, 인크(Partek, Inc.)로부터의 "디스커버리(DISCOVERY)" 및 "인퍼(INFER)" 소프트웨어에 포함된 것들과 같은 클러스터링 알고리즘은 이러한 데이터의 가시화를 최상으로 보조할 수 있다. "Discovery (DISCOVERY)" and "inpeo (INFER)" Clustering algorithms such as those included in the software from the Parr Tech, Inc. (Partek, Inc.) mentioned above may assist in the visualization of such data, the best . 본 발명에 따른 상이한 유형의 제조 물품은 유전자 발현 프로파일을 드러내는 데 사용되는 매체 또는 양식화된 분석이다. The article of manufacture of different types according to the present invention is an analysis medium or formatting that is used to reveal gene expression profiles. 이들은, 예를 들어, 서열 상보체 또는 프로브가 매트릭스에 고정된 마이크로어레이를 포함할 수 있는데, 상기 상보체 또는 프로브에 관심 유전자를 나타내는 서열들이 화합되어 상기 관심 유전자의 존재의 판독가능한 결정자를 생성하게 된다. These include, for example, sequences complementary thereof, or the probe may comprise a microarray fixed to the matrix, the complement or a sequence representing the gene of interest to a probe have been combined to create a readable determinant of the presence of the gene of interest do. 대안적으로, 본 발명에 따른 물품은 혼성화, 증폭, 및 암을 탐지하기 위한 관심 유전자의 발현 수준을 나타내는 신호 생성을 수행하기 위한 시약 키트로 만들어질 수 있다. Alternatively, articles according to the present invention can be made of a reagent kit for carrying out the signal produced indicating the level of expression of genes of interest for detecting hybridization, amplification, and cancer. 하기 실시예는 본 발명을 제한하기 위해서가 아니라 예시하기 위해 제공된다. The following examples are provided to illustrate, not to limit the invention. 78명의 부호화된 II기 및 59명의 III기 결장암 환자로부터 냉동 종양 표본을 입수하였다. The 78 coding group II and group III was obtained a 59-frozen tumor specimens from colon cancer. 보관된 원발성 종양 시료는 수술 시점에서 수집하였다. Archived primary tumor samples were collected at the time of surgery. 각 표본의 조직병리학적 특성을 H&E 염색된 조직 절편 상에서 관찰하여 진단 및 종양 함량을 확인하였다. By observing the histopathological characteristics of the sample on the tissue sections were H & E staining confirmed the diagnosis and tumor content. 종양 함량은 상피 종양 세포의 핵을 계수함으로써 백분율로 평가하였다. Tumor content was evaluated as a percentage by counting the nuclei of epithelial tumor cells. 환자 적격 기준은 다음을 포함한다: 결장 원발성 II기 및 III기 샘암종, 일차 치료는 보조 요법 또는 신보조 요법 없이 수술이 유일함, 조직 시료 내 종양 세포가 적어도 70%, 및 3년 이내에 원격 재발이 발생한 환자를 제외하고는 적어도 3년의 추적검사. Patient eligibility criteria include: absence of primary stage II and stage III adenocarcinoma, the primary treatment is also surgery only without adjuvant or neoadjuvant therapy, tissue samples remote recurrence within tumor cells is at least 70%, and 3 years except for the patient occurred and the follow-up of at least three years. 수술후 환자 관찰은 환자에 대한 신체 검사, 혈구 계산, 간 기능 검사, 혈청 CEA, 및 대장내시경 검사를 포함하는 결장암 환자에 대한 일반적 진료관행에 따라 수행하였다. Postoperative patient observation was performed according to the physical examination, blood calculation, liver function tests, serum CEA, and general medical practice for colon cancer, including colonoscopy for the patient. 선발된 환자는 복부 CT 스캔 및 흉부 X-선 검사를 받았다. The selected patients received a CT scan of the abdomen and chest X- ray examination. 만약 암 재발이 의심되면, 환자는 대장내시경 검사, 흉부/복부/골반 CT 및 선별된 환자에 대한 MRI를 포함하는 진단 정밀검사를 받았다. If cancer is suspected recurrence, patients received a diagnostic probe that includes an MRI for colonoscopy, chest / abdominal / pelvic CT, and selected patients. 전이성 병변을 확인하기 위한 진단 생검을 실행가능한 모든 환자에게 수행하였다. Was performed for all patients can run a diagnostic biopsy to check for metastatic disease. 재발까지의 기간 또는 무질환 기간은 재발된 환자에 대해서는 수술일로부터 확인된 종양 재발일까지, 무질환 환자에 대해서는 수술일로부터 최종 추적 검사일까지의 기간으로 정의하였다. Disease-free period or a period of up to relapse was defined as the period for relapsed patients to the surgery, the tumor recurred from day one confirmed, one from the surgery for the disease-free until the final track geomsail. 85명의 II기 및 38명의 III기 결장암 환자로부터 FPE 종양 표본을 입수하였다. The 85 stage II and stage III FPE 38 tumor samples from colon cancer patients were obtained. 180개의 II기 결장암 FPE 표본도 별도로 획득하였다. 180 II group FPE colon cancer specimen was also obtained separately. 각 표본의 조직병리학적 특성을 관찰하여 진단 및 종양 함량을 확인하였다. By observing the histopathological characteristics of the sample it was confirmed diagnosis and tumor content. 환자 적격 기준 및 추적검사 과정은 냉동 시료의 선발에 대한 것과 동일하였다. Patient eligibility criteria and follow-up procedure was the same as for the selection of frozen samples. 모든 냉동 종양 조직에 대해 RNA 분리를 수행하였다. RNA isolation was performed on all frozen tumor tissue. 백스터 등 (2005). Baxter et al. (2005). 비오티닐화 표적을 공개된 방법(어피메트릭스, 미국 캘리포니아주 산타 클라라(Santa Clara, CA) 소재)을 이용하여 제조하였고 어피메트릭스 U133a 진칩(GeneChips)(어피메트릭스, 미국 캘리포니아주 산타 클라라 소재)에 혼성화하였다. Biotinylated public way signs (Affymetrix, Santa Clara, California (Santa Clara, CA) material) was used produced by hybridization to Affymetrix U133a GeneChip (GeneChips) (Affymetrix, Santa Clara, California materials) It was. 어레이를 표준 어피메트릭스 프로토콜을 이용해 스캔하였다. The array was scanned using standard Affymetrix protocols. 각 프로브 세트를 개별적인 유전자로 간주하였다. Each probe set was considered as a separate gene. 각 유전자의 발현 값을 어피메트릭스 진칩(®) 분석 소프트웨어 MAS 5.0을 사용하고 앞서 기재된 분석 방법에 따라 계산하였다. The expression value of each gene using the Affymetrix GeneChip (®) analysis software MAS 5.0, which was calculated according to the analysis method described earlier. 왕 등 (2004). Wang et al. (2004). FPE 시료는 포르말린-고정(n = 45) 또는 홀렌데스(Hollandes)-고정(n = 65) FPE 조직 중 어느 하나였다. FPE samples are formalin-fixed (n = 45) or holren des (Hollandes) - was fixed (n = 65) any one of the FPE tissues. FPE 조직 시료로부터의 RNA분리를 고순도 RNA 파라핀 키트(High Pure RNA Paraffin Kit, 로쉐 어플라이드 사이언스(Roche Applied Sciences), 미국 인디애나주 인디애나폴리스(Indianapolis, IN) 소재)를 사용해 변경된 프로토콜에 따라 수행하였다. RNA isolation from FPE tissue samples was performed according to the changed use of high purity RNA Paraffin Kit (High Pure RNA Paraffin Kit, Roche Applied Science (Roche Applied Sciences), Indianapolis, Indiana, USA (Indianapolis, IN) material) protocol. FPE 조직 블록을 블록의 크기에 따라 절편으로 만들었다(6-8 ㎜ = 6 X 10 ㎛, ≥ 8 ㎜ = 3 X 10 ㎛). Made FPE tissue blocks into sections according to the size of the block (6-8 ㎜ = 6 X 10 ㎛, ≥ 8 ㎜ = 3 X 10 ㎛). 제조사의 매뉴얼에 기재된 바와 같이 절편으로부터 파라핀을 제거하였다. To remove the paraffin from the sections, as described in the manual of the manufacturer. 조직 펠렛을 55℃ 오븐에서 10분간 건조시키고 100 ㎕의 조직 용해 완충액, 16 ㎕ 10% SDS 및 80 ㎕ 프로테이나아제 K에 재현탁하였다. 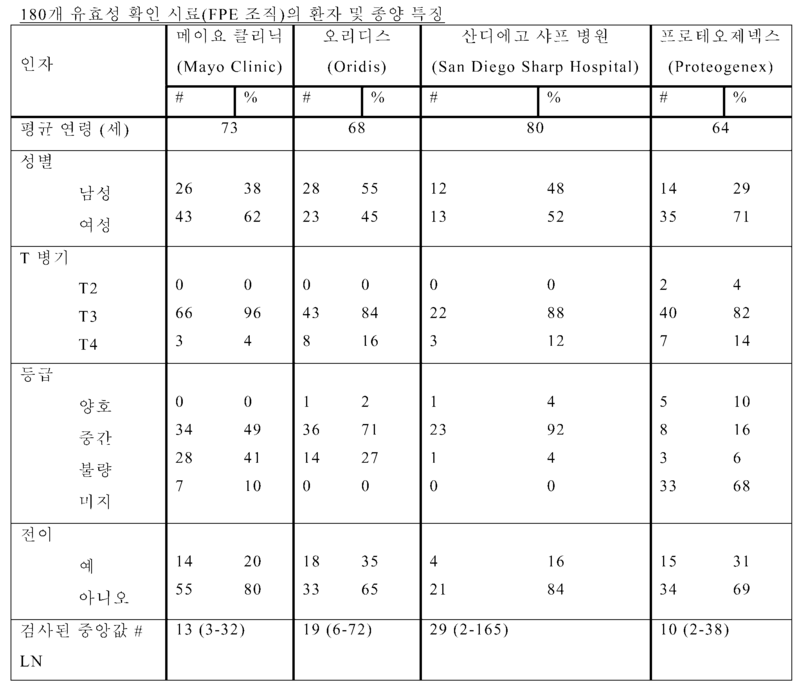 Drying for 10 minutes the tissue pellet in 55 ℃ oven and was suspended in 100 ㎕ better tissue lysis buffer, 16 ㎕ 10% SDS and 80 ㎕ Pro table reproduced in the K. 시료를 와동시키고 55℃에서 3시간 동안 400 rpm으로 서모믹서 세트(thermomixer set) 내에서 인큐베이션하였다. Vortex the sample was at 55 ℃ for 3 hours followed by incubation in thermo mixer set (thermomixer set) to 400 rpm. 시료 가공의 후속 단계를 키트 매뉴얼에 따라 수행하였다. The subsequent steps of the sample processing was performed according to the kit manual. RNA 시료를 분광광도계를 사용해 OD 260/280 판독에 의해 정량하고 50 ng/μL의 최종 농도로 희석하였다. The RNA samples using a spectrophotometer was quantified by OD 260/280 readings and diluted to a final concentration of 50 ng / μL. 분리된 RNA 시료를 사용 전까지 -80℃에서 RNase 무함유 물 중에 보관하였다. The separated RNA sample at -80 ℃ until use and stored in RNase-free water. EP2MA 프로브, FAM-CAGGCGGTGTGCCTGCTGCAT-BHQ. EP2MA probe, FAM-CAGGCGGTGTGCCTGCTGCAT-BHQ. KLF5 프로브, FAM-CAAGTGTACCTGGGAAGGCTGCGACTG-BHQ. KLF5 probe, FAM-CAAGTGTACCTGGGAAGGCTGCGACTG-BHQ. CAPG 프로브, FAM-AACCTGACCAAGGTGGCTGACTCCAG-BHQ. CAPG probe, FAM-AACCTGACCAAGGTGGCTGACTCCAG-BHQ. LILRB3프로브, FAM-CCCAGGATGTGACCTACGCCCAG-BHQ. LILRB3 probe, FAM-CCCAGGATGTGACCTACGCCCAG-BHQ. LAT 프로브, FAM-CGGGATTCTGATGGTGCCAACAGT-BHQ-1-TT. LAT Probe, FAM-CGGGATTCTGATGGTGCCAACAGT-BHQ-1-TT. CHC1 프로브, FAM-CCACGTGTACGGCTTCGGCCTC-BHQ. CHC1 probe, FAM-CCACGTGTACGGCTTCGGCCTC-BHQ. YWHAH 프로브, FAM-ATCATGGGCATTGCTGGACTGATGG-BHQ. YWHAH probe, FAM-ATCATGGGCATTGCTGGACTGATGG-BHQ. β-액틴 프로브, FAM-AGAATGGCCCAGTCCTCTCCCAAGTC-BHQ. β- actin probe, FAM-BHQ-AGAATGGCCCAGTCCTCTCCCAAGTC. HMBS 프로브, FAM-CTGGCTTCACCATCG-BHQ. HMBS probe, FAM-CTGGCTTCACCATCG-BHQ. 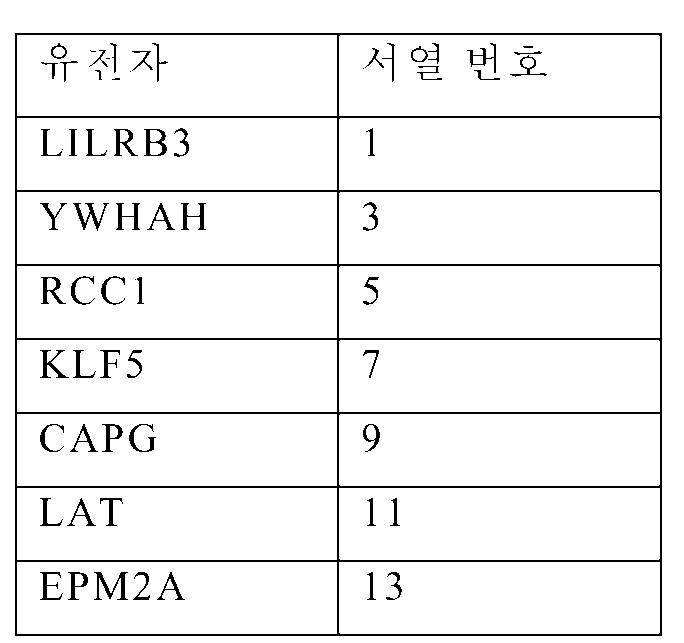 RPL13A 프로브, FAM-CGGAAACAGGCCGAGAA-BHQ. RPL13A probe, FAM-CGGAAACAGGCCGAGAA-BHQ. 각 시료에 대해 ΔCt = Ct (표적 유전자) - Ct (4개 대조군 유전자의 평균)을 계산하였다. The Ct (average of 4 dogs control gene) were calculated - ΔCt = Ct (target gene) for each sample. ΔCt 정규화는 임상 RTQ-PCR 분석에 광범위하게 사용되고 있다. Normalization ΔCt has been widely used in clinical RTQ-PCR analysis. t 검정을 사용하여 II기 결장암과 III기 결장암 환자들에 대한 각 유전자의 변별력을 비교하였다. using a t-test compared the discrimination of each gene for stage II colon cancer and stage III colon cancer. III기일 가능성을 평가하기 위한 모델을 구축하기 위해 훈련 세트로서 CCF 환자에 대해 지수형 회귀 모형(Logistic regression)을 사용하였다. As a training set to build a model for III to assess the likely date was used exponential regression model (Logistic regression) for CCF patients. 지수형 모델로부터 얻어진 각 환자가 III기일 확률을 이용하여 ROC (Receiver's Operating Characteristic) 곡선을 작성하였다. Each patient resulting from the exponential model using a probability III date to prepare a curve (Receiver Operating Characteristic's) ROC. 적어도 90% 특이도(II기 환자의 90%가 정확하게 식별됨)가 나오도록 ROC 곡선으로부터 확률의 역치를 선택하였다. At least 90% were selected for specificity of the threshold of the probability from the ROC curve to the out (II groups being 90% of the patients correctly identified). 이어서 훈련 세트로부터 구축된 모델을 사용하여 검사 세트들 중 하나에 속한 환자들에 대해 III기일 확률을 계산하였다. Then we calculated the probability III date for the patients using the model built from the training set belonging to one of the test set. 카플란 메이어 생존 곡선(카플란 등, 1958) 및 콕스 (Cox) 비례 위험 회귀 모형으로부터 계산된 위험률을 사용하여 예측 II기 환자와 예측 III기 환자 사이의 무재발 생존의 차이를 평가하였다. Using the risk calculated by Kaplan Meyer survival curves (Kaplan et al., 1958) and Cox (Cox) proportional hazard regression model to evaluate the difference in relapse-free survival between the predicted patient group II and group III predicted patient. 에스-플러스(S-Plus)(®) 6·1 소프트웨어(인사이트풀(Insightful), 미국 버지니아주 페어팩스 스테이션(Fairfax Station, VA) 소재)를 사용하여 모든 통계학적 분석을 수행하였다. S-Plus (S-Plus) (®) 6 · 1 All statistical analyzes using the software (Insight Pool (Insightful), United States Fairfax Station, Virginia (Fairfax Station, VA) material) were carried out. 환자 및 이들의 종양에 대한 임상적 및 병리학적 특징을 표 1 및 표 2에 요약하였다. The clinical and pathological features of the patients and their tumors are summarized in Table 1 and Table 2. 모든 환자들은 연령, 성별, TNM 병기, 조사된 림프절의 개수, 및 종양 위치에 대한 정보를 가지고 있다. All patients have the information about age, gender, TNM stage, number of lymph nodes examined, and tumor location. 모든 환자들은 산발성 결장암을 가지고 있었다. All patients had sporadic colon cancer. 직장암 환자는 본 연구로부터 배제되었다. Cancer patients were excluded from the study. TNM 병기 구분을 AJCC 6판 지침에 따라 수행하였다. The TNM staging nine minutes was carried out according to the AJCC 6 plates guidelines. 조직학적 등급 또는 분화 상태도 각 임상 기관에 의해 기록되었다. Histological grade or differentiation status were also recorded by each clinical institutions. 조사된 림프절의 개수는 시료가 상이한 시기에 보관된 수집으로부터 입수되었기 때문에 임상 기관들 사이에서 달랐다. The number of lymph nodes examined is because the sample is obtained from the collected stored at different times were different between the clinical institutions. 환자들은 수술로만 치료되었고 환자들 중 누구도 신보조 또는 보조 치료를 받지 않았다. Patients did not receive neoadjuvant or adjuvant therapy, none of the patients were treated only with surgery. 3년 미만에 재발 또는 사망한 환자를 제외하고는 최소 3년의 추적 검사 데이터가 본 연구에서 모든 환자에 대해 입수가능하였다. Except for patients who relapse or death in less than three years were available for all patients in the follow-up data at least three years of this study. 통계적 분석은 종양 특징이 재발 환자와 무재발 환자 사이에 유의하게 다르지 않았음을 제시하였다. Statistical analysis suggested that no tumor characteristics significantly different between patients with recurrent and non-recurrent patients. 신선한 냉동 시료 내 유전자 표지의 분석. Analysis of genetic markers in fresh and frozen samples. 이전에 행해진 연구의 환자 시료군(왕 등(2004))의 경우, 2개 아군에서 각각 분화가 양호 및 불량한 종양을 나타내는 종양들이 탐지되었다. For a patient sample group of previously conducted studies in (Wang et al. (2004)), are shown for each tumor is good and poor tumor differentiation was detected in the two spiked. 캐드헤린(Cadherin) 17 유전자 발현을 이용하여 II기 종양을 2개의 하위군으로 분류하고 예후 유전자 표지를 하위군 I(7개 유전자들) 및 하위군 II(15개 유전자들)에 대한 분류인자를 포함하도록 고안하였다. A classifier for cadherin (Cadherin) (the seven gene), the classification and prognosis genetic markers for stage II tumor using a 17 gene expression of two sub-groups subgroup I and subgroup II (the 15 genes) It was designed to contain. 본 연구에서는, 78개의 II기 종양 중 1개(1.3%) 및 59개의 III기 종양 중 1개(1.7%)만이 하위군 II(탐지불가능 캐드헤린 17)에 속하였음을 발견하였다. In this study, it was found that only 78 II group 1 (1.3%) and 59 III group 1 (1.7%) of the tumor during tumor hayeoteum belongs to subgroup II (detection impossible cadherin 17). 따라서, 본 연구를 위한 알고리즘에서는 하위군 I에 대한 7개 유전자들만을 포함하는 개선된 유전자 표지를 구성하였다. Therefore, in the algorithm for this study it was constructed for improved genetic markers that contain only seven genes for the sub-group I. 이들 7개 유전자들을 젠뱅크(GenBank) ID 및 어피메트릭스 U133a 칩 ID와 함께 표 3에 열거하였다. These seven genes with Zen bank (GenBank) and ID Affymetrix U133a chip ID are listed in Table 3. 상기 7개-유전자 표지의 병기 결정 특성을 평가하기 위해, 본 발명자들은 먼저 t 검정을 이용하여 임상적으로 정의된 II기 및 III기 환자들을 구별하는 데 대한 7개 유전자들의 변별력을 비교하였다. The seven-to assess the staging nature of the marker gene, the present inventors first compared the discrimination of the seven genes to distinguish clinically group II and group III patients defined by using the t-test. 이어서 지수형 회귀 모형을 137개 시료에 적용하여 각 환자가 III기 또는 II기일 가능성을 평가하는 모델을 구축하였다. Then apply the exponential regression in 137 samples was to build a model to assess the potential of each patient group III or II group. 병기 예보자로서 7개-유전자 표지의 성능을 평가하기 위해 사용된 매개변수는 ROC 분석의 곡선 하 면적(area under the curve, AUC)이었다. Stage 7 by way of example let-mediated used to evaluate the performance of the genetic markers variable was the area (area under the curve, AUC) and the ROC curve analysis. 도 1a에 나타난 바와 같이, 표지는 0.9의 AUC 값을 제시하였다. As shown in Figure 1a, the cover is presented the AUC value of 0.9. 카플란-메이어 분석으로 예측 II기 및 III기 환자들에 대한 생존 곡선을 산출하였다 (도 1b). Kaplan-Meyer analysis was to calculate the survival curves for the prediction stage II and stage III patients (Fig. 1b). 명확히, 예측 II기 및 III기 환자들은 예후가 양호 (예측 II기 환자) 및 불량(예측 III기 환자)한 2개의 별개의 환자 집단으로 분리되었다. Clearly, the prediction stage II and stage III patients are good (predictions stage II patients) and poor prognosis (predicted Stage III patients) was isolated as two distinct patient population. 단일 변량 Cox 비례 위험 회귀 모델에서, 종양 재발에 대한 추정 상대적 위험도는 2.7 (95% CI, 1.3 - 5.5, P = 0.007)이었다. In univariate Cox proportional hazards regression model, the estimated relative risk for tumor relapse is 2.7 (95% CI, 1.3 - 5.5, P = 0.007) , respectively. 임상적으로 관련있는 시료들에서 상기 7개 유전자 표지의 병기 결정 유효성을 입증하기 위해, RTQ-PCR 분석을 개발하였고 II기 및 III기 결장 종양 유래 123개의 FPE 시료에 대해 먼저 수행하였다. To demonstrate the effectiveness of staging the seven genetic markers in the sample related to clinical and we developed the RTQ-PCR analysis was performed for the first stage II and stage III colon tumor-derived 123 FPE samples. RTQ-PCR 분석은 시료 유형 및 분석 플랫폼 면에서 마이크로어레이 분석과 완전히 다르기 때문에, 7개 유전자들의 병기 변별력을 t 검정에 의해 재평가하였다. RTQ-PCR analysis was due entirely different from the microarray analysis in terms of the sample type and analysis platform, and re-evaluated by the stage discrimination of the seven genes in the t-test. 이들 123 환자 RTQ-PCR 데이터세트에 대한 지수형 회귀를 사용해 각 환자가 III기 또는 II기일 가능성을 평가하기 위한 모델을 다시 구축하였다. Using the Exponential regression for these 123 patients RTQ-PCR data set for each patient was re-established a model for assessing potential III group or II group. 먼저, ROC 곡선을 평가하였다 (도 2a). First, to evaluate the ROC curve (FIG. 2a). 7개 유전자 예보자는 0.77의 AUC 값을 제시하였다. 7 gene The forecast was presented the AUC value of 0.77. 카플란-메이어 분석 및 로그 순위 검정 모두 예측 III기 암을 가진 군과 예측 II기 암을 가진 군 사이에 재발까지의 시간에 있어서 유의한 차이를 보여주었다 (HR 2.4, 95% CI 1.1 - 5.2; P = 0.02) (도 2b). Kaplan-show a significant difference in the Meyer analysis and log rank test group with predicted Stage III cancer both with time to recurrence between prediction II group the group with cancer gave (HR 2.4, 95% CI 1.1 - 5.2; P = 0.02) (Figure 2b). 7개-유전자 표지를 임상적으로 정의된 II기 및 III기 결장암에 대해 검사하였고 이 표지가 마이크로어레이 플랫폼 상의 신선한 냉동 표본과 RTQ-PCR 플랫폼 상의 FPE 표본에 대해 이들 두 부류를 구별하는 능력을 가지고 있음을 입증하였다. 7 - were examined for the stage II and stage III colon define the genetic markers as clinically cover has the ability to distinguish between these two categories for fresh and frozen samples and FPE samples on the RTQ-PCR platform on microarray platforms that was proven. 기정의된 7개-유전자 표지가 임상적으로 정의된 II기 결장암에 대해 예후가 불량한 환자로부터 예후가 양호한 환자를 구별할 수 있을 것인지 여부를 검사하기 위해, 180개의 검정 세트 시료를 사용하여 7개 유전자의 유용성을 평가하였다. Fixation of the seven-to the genetic markers to check whether it can not distinguish a good prognosis patients from the poor prognosis patients for a stage II colon cancer defined by clinical and 7 using 180 test set sample to evaluate the usefulness of the gene. 123개의 II기 및 III기 시료 세트로부터 얻어진 기정의된 모델 및 알고리즘을 적용함으로써, 180명의 임상 II기 환자 중 150명이 예측 II기 암으로 분류되었고 30명의 임상 II기 환자는 예측 III기 암으로 분류되었다. By applying a 123 stage II and stage III predefined model and algorithm obtained from the sample set was 150 of 180 clinical stage II patients were classified in prediction stage II cancer 30 clinical stage II patients are classified as predicted Stage III cancer It was. 카플란-메이어 분석 및 로그 순위 검정 모두, 도 3에 나타난 바와 같이, 예측 III기 암을 갖는 군과 예측 II기 암을 갖는 군 사이에 재발까지의 시간에 있어서 유의한 차이를 보여주었다 (HR 2.0, 95% CI 1.0 - 3.6; P = 0.05). Kaplan-both Meyer analysis and log rank test, as shown in Figure 3, showed a significant difference in the time to relapse among the group having the group and the prediction stage II cancer with a predicted Stage III cancer (HR 2.0, 95% CI 1.0 - 3.6; P = 0.05). 서열 번호 1, 서열 번호 3, 서열 번호 5, 서열 번호 7, 서열 번호 9, 서열 번호 11, 및 서열 번호 13으로 필수적으로 이루어진 유전자 조합에서 차등 조절(differential modulation)을 확인하는 단계를 포함하는, 결장직장암 상태의 병기를 결정하는 방법. SEQ ID NO: 1, SEQ ID NO: 3, SEQ ID NO: 5, SEQ ID NO: 7, SEQ ID NO: 9, comprising the step of verifying the SEQ ID NO: 11, and SEQ ID NO: differential regulation in essential DNA, consisting of the 13 (differential modulation) colon a method of determining the stage of cancer status. 제1항에 있어서, II기와 III기 결장직장암이 구별되는 방법. According to claim 1, II group III group method is colorectal cancer are distinguished. 제2항에 있어서, 발현 패턴의 비교가 패턴 인식 방법을 이용해 수행되는 방법. The method of claim 2, wherein the comparison of expression patterns is performed using a pattern recognition method. 제3항에 있어서, 패턴 인식 방법이 콕스(Cox) 비례 위험 분석의 사용을 포함하는 방법. The method of claim 3, wherein the pattern recognition method of the method include the use of Cox (Cox) proportional hazards analysis. 제1항에 있어서, 원발성 종양 시료에 대해 수행되는 방법. The method of claim 1 wherein the process is carried out on primary tumor sample. 제1항에 있어서, 시료의 유전자 발현 패턴이 II기를 나타내는 콕스 비례 위험 분석의 패턴의 것이라면 결장직장암은 II기 결장직장암이고, 그렇지 않다면 III기 결장직장암인 방법. The method of claim 1, wherein the gene expression pattern of the sample if the Cox proportional hazard analysis of the pattern represents a II colorectal cancer is colorectal cancer group II, group III otherwise the method colorectal cancer. 서열 번호 1, 서열 번호 3, 서열 번호 5, 서열 번호 7, 서열 번호 9, 서열 번호 11, 및 서열 번호 13을 포함하는 유전자 조합의 분리된 핵산 서열, 이들의 상보체, 또는 이들의 일부분을 탐지하기 위한 재료를 포함하는, 결장직장암 환자의 병기를 결정하기 위한 키트. SEQ ID NO: 1, SEQ ID NO: 3, SEQ ID NO: 5, SEQ ID NO: 7, SEQ ID NO: 9, SEQ ID NO: 11, and SEQ ID NO: An isolated nucleic acid of the DNA, containing the 13 sequences, detecting their complement, or a part containing the material to, kits for determining the staging of colorectal cancer patients. 제7항에 있어서, 유일한 유전자 조합이 서열 번호 1, 서열 번호 3, 서열 번호 5, 서열 번호 7, 서열 번호 9, 서열 번호 11, 및 서열 번호 13과 하우스키핑(housekeeping) 또는 대조군 유전자인 키트. The method of claim 7, wherein the only DNA, SEQ ID NO: 1, SEQ ID NO: 3, SEQ ID NO: 5, SEQ ID NO: 7, SEQ ID NO: 9, SEQ ID NO: 11, and SEQ ID NO: 13 and the Housekeeping (housekeeping) or control gene in the kit. 제8항에 있어서, 마이크로어레이 분석을 수행하기 위한 시약을 추가로 포함하는 키트. The method of claim 8 wherein the kit further comprises a reagent for performing a microarray assay. 제9항에 있어서, 상기 핵산 서열, 이들의 상보체 또는 이들의 일부분을 분석하는 매체를 추가로 포함하는 키트. 10. The method of claim 9, wherein the nucleic acid sequence, the complement thereof or kit further comprises a medium for analyzing a portion thereof. 서열 번호 1, 서열 번호 3, 서열 번호 5, 서열 번호 7, 서열 번호 9, 서열 번호 11, 및 서열 번호 13을 포함하는 유전자 조합의 핵산 서열, 이들의 상보체 또는 이들의 일부분을 확인하기 위한 재료를 포함하는, 결장직장암 상태를 평가하기 위한 물품. Materials to confirm the SEQ ID NO: 1, SEQ ID NO: 3, SEQ ID NO: 5, SEQ ID NO: 7, SEQ ID NO: 9, SEQ ID NO: 11, and SEQ ID NO: The nucleic acid of the DNA, containing the 13 sequences, their complement or a portion Goods for assessing colorectal cancer status comprising a. 제11항에 있어서, 유일한 유전자 조합이 서열 번호 1, 서열 번호 3, 서열 번호 5, 서열 번호 7, 서열 번호 9, 서열 번호 11, 및 서열 번호 13과 하우스키핑 또는 대조군 유전자인 물품. The method of claim 11, wherein the article is the only DNA, SEQ ID NO: 1, SEQ ID NO: 3, SEQ ID NO: 5, SEQ ID NO: 7, SEQ ID NO: 9, SEQ ID NO: 11, and SEQ ID NO: 13 or control and housekeeping gene. 제12항에 있어서, 마이크로어레이 분석을 수행하기 위한 시약을 추가로 포함하는 물품. 13. The method of claim 12 wherein the article further comprises a reagent for performing a microarray assay. 제13항에 있어서, 상기 핵산 서열, 이들의 상보체 또는 이들의 일부분을 분석하는 매체를 추가로 포함하는 물품. 14. The method of claim 13 wherein the article further comprises the nucleic acid sequence, the complement thereof, or medium for analyzing a portion thereof. 제11항에 있어서, PCR 반응을 수행하기 위한 시약을 포함하고, 상기 시약은 서열 번호 1, 서열 번호 3, 서열 번호 5, 서열 번호 7, 서열 번호 9, 서열 번호 11, 및 서열 번호 13과 하우스키핑 또는 대조군 유전자로 필수적으로 이루어진 유전자들을 탐지하기 위한 프로브 및 프라이머를 포함하는 물품. 12. The method of claim 11, further comprising reagents for performing the PCR reaction, the reagent is SEQ ID NO: 1, SEQ ID NO: 3, SEQ ID NO: 5, SEQ ID NO: 7, SEQ ID NO: 9, SEQ ID NO: 11, and SEQ ID NO: 13 and a house an article comprising a probe and a primer for detecting a gene consists of the essentially keeping gene or control group. 제15항에 있어서, 결장직장암의 병기를 결정하기 위해 키트 사용의 결과를 분석하기 위한 설명서를 추가로 포함하는 물품. 16. The method of claim 15 wherein the article further comprises a guide for analyzing the results of the kit used to determine the stage of colorectal cancer. 제16항에 있어서, 설명서가 컴퓨터 설명서인 물품. 17. The method of claim 16, wherein the article is a computer manual documentation. 제17항에 있어서, 컴퓨터 설명서가 자기 또는 광학 매체에 들어있는 물품. 18. The method of claim 17 wherein the article with a machine containing guide the magnetic or optical medium.